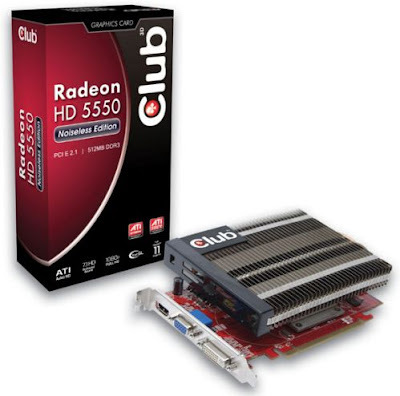 The Club3D Radeon HD 5550 is Noiseless Edition thanks to the passive cooling used. The card features a dual slot passive cooling solution with a rather large aluminium heatsink and two copper heatpipes. the new HD 5550 features 320 Stream processors, a 550MHz core clock, 128-bit memory interface paired up with 512MB of GDDR3 memory working at 800MHz. The new HD 5550 features D-Sub, DVI and HDMI outputs and should show up in retail/e-tail pretty soon. Although Club3D didn't mention anything about the price we guess that this one should cost somewhere around €60.